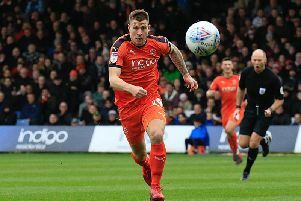 Luton midfielder Luke Berry admitted his team used seeing promotion rivals Barnsley winning as extra motivation ahead of their home clash with Doncaster Rovers on Saturday. The Hatters had the game on in the changing room prior to their match, as they saw the Tykes cut the gap to just two points, thanks to a stoppage time winner in beating Walsall 1-0. Boss Mick Harford continued: “We watched the game, and Walsall were unlucky we thought in terms of chances. “We go and play the way we want to play, we play our way, and the players proved they can do that under a little bit of pressure. “Overall we just asked them to play relaxed football and enjoy themselves, make sure we were solid. With Sunderland not in action, the win saw Town move 10 points in front of the Black Cats, who now have two games in hand. The Wearsiders are without a league match this weekend too, taking on Portsmouth in the Checkatrade Trophy final, as Berry wants to open up a big gap.